Not much has changed since the last report. 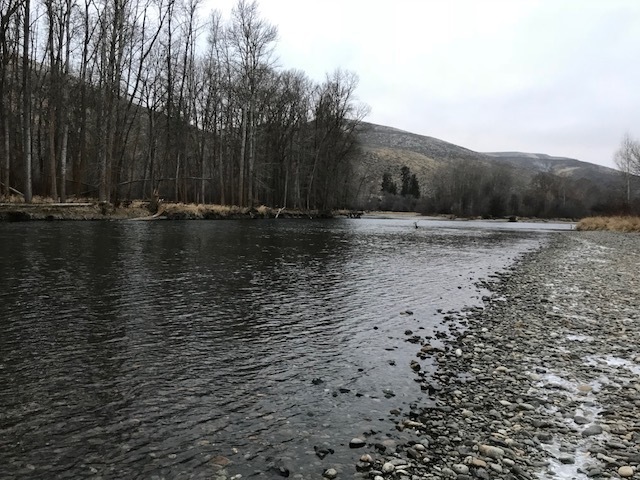 The cold and cloudy weather has been hanging around the valley all week, which has kept the river low and clear. Fishing has stayed consistent, and by that I mean there are fish being caught, but the colder weather has kept things in check. Nymphing a Pat's trailed by a San Juan or midge pupa has been producing some good numbers midday. Make sure to focus on the slower, deeper water this time of year with your nymph rigs, and set on any twitch, tap , or bump on that indicator. Yarn can be a beter option than Thingamabobbers or Air-Locks this time of year. Swinging or stripping streamers has been the best way to target the larger fish lately, and olive/white Dali Llamas, olive or black Sculpzillas or hot-bead buggers in olive have all been guide favorites as of late. It looks like we will be seeing a change in weather starting this weekend, with slightly warmer temps on the way, which may make for a great winter bite!